Home » Auto Facts » Should I get my brakes checked? We know when it’s time to change our oil. We know when our tires are low on air. And we know when our gas tank isn’t full. But what is the best way to know what is happening with our car’s brakes and when the right time to replace brake pads is? Are there signs to look out for? 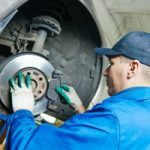 You may have heard that the best way to gauge whether or not your brakes should be replaced is to wait until you hear them. This is terrible, awful advice. By the time your brakes are making noise, they may well be unsafe, and there is likely damage to the rotors. It is much less expensive to replace brake pads than it is to replace rotors. Not to mention the fact you are putting yourself at risk if you brakes are not performing properly. Another sign people may look out for is braking distance. Again, it is critical to maintain your brakes and brake pads. You do not want your first indication of poor brake performance to be increased braking distance. Is there a brake warning light on the dashboard? The great majority of cars do have a brake warning light on them. However, this light has nothing to do with brake pads, what it calls attention to is the level of brake fluid. Brake fluid is also a critical component to your brakes working properly. If you see this light bring your car in for service immediately. The right time to replace your brake pads. Unlike your oil or gas, there is no way to gauge when brake pads are wearing out. It isn’t possible to do it based on time or distance either. 3 months of country driving may not even equal one month of driving in heavy stop-and-go city traffic. The highway is much nicer to your brake pads than the daily grind of bumper to bumper traffic and stoplights. So, the best thing to do is to have your brake pads checked on a regular basis. Every six months is a good schedule to keep. You can do it as part of maintenance in preparation for winter and in spring in preparation for summer road trips. Questions about Financing? Interested in Used Cars? Want know the current specials? Come into Gil’s! Where should I watch the Super Bowl in Columbus GA? This entry was posted on Monday, January 16th, 2017 at 1:43 pm	and is filed under Auto Facts, Informational, Safety. You can follow any responses to this entry through the RSS 2.0 feed. You can skip to the end and leave a response. Pinging is currently not allowed. Brake are the safety components of any automobile. It is necessary to check your brake regularly and change it in appropriate time. Generally, the first indication a car driver will notice is a squealing, screeching, or whining noise when the brakes are engaged. This sound is caused by a small, metallic cylinder indicator that’s embedded in your brake pad. It is there for this purpose only. If you hear it regularly while braking, then it is the time to bring your car near brake specialist for an inspection.